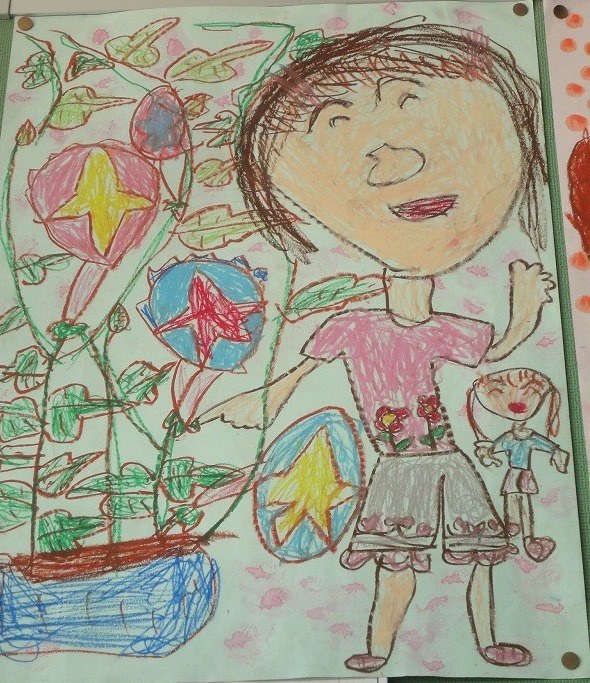 My elder daughter drew herself and the ipomoea nil she grew. Fortunately this picture was selected among her classmaetes’ and went on display in her school entrance. This picture is unique regardless of whether it was selected or not. We parents always don’t have good ideas on how to store these precious works. This paper will be depleted in a couple of years. There isn’t enough space to store them. Or I can scan them as electronic data but this takes much time. So I have to select them carefully . Electronic data sometimes gives us a cold impression. When I think about it carefully, the works that I made in my childhood have nothing left but I don’t miss them much. In fact keeping children’s works may be more for the parents rather than for the children. Certainly wordpress will live forever but I want to back up wordpress’s data. I have to learn to do. Thanks much. I look forward to your continued cooperation.. This painting is colorful and delightful. The painter drew herself big, much bigger in perspective, which shows her delight and confidence as well, I think. I would displayed my favorite one on the wall, which my children didn’t like. If my children were young like yours now, I’d like to take pictures of children’s pictures and show them on digital photo frame from time to time. My daughters’s confidence is very glad for the parents because she was gawky child. Digital photo frame sounds nice.We can enjoy it together. This flower looks balloon as you say.This picture is a living art form. We parents definitely cherish all our children’s work. I hope this wordpress will be immortalised foreveralthough I don’t know it is guaranteed. Children’s work is artistic anytime..
Thanks.It is the most important that she enjoy drawing the picture. I’ve thought about this before because at one of my schools the teachers sometimes take photos of the pictures students draw before throwing them away. They said they do this because they’re precious. But I really wonder if the students will care or if they will ever see them again. I think sometimes they’re just a nice memento for parents or parental figures, as you said. Guess I’ll have a better idea about it when I have my own kids. Memento is the most valuable when we’re received. We seldom remember it in the future. A very positive, bright and happy picture. Thanks a lot. I think so. It might be a reflection of my daughter’s mind.